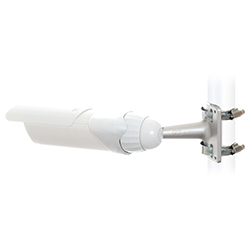 If you have ever used Ubiquiti airCams, you know how powerful they are and how the low price point makes them perfect for almost any security application. One area where we have seen some weakness is the mounting system. I wrote about this briefly last month but now that we have these in stock and not just the prototypes, I thought it worth rehashing. 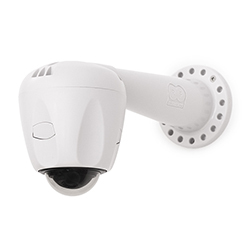 Although it fully articulates, the stock mount is not very strong and in high wind conditions, the camera will move causing false motion detection. RFElements has a new product, the AbraCam Mount which makes these cameras extremely stable in outdoor environments. The mounts come in three designs, all less than $15 each and they turn these powerful, low cost cameras into high end, professional looking and performing devices. As a test, I took 4 and installed them in Colorado in an area in the mountains that regularly experiences mountain winds coming off the continental Divide in excess of 100 mph. The site was really getting weary from tons of false motion detects as the airCams swayed in the wind. The results of the new mounts were great, no more false positives at all. The cameras are rock stead and easy to adjust. This is a hot product so come and get some before the first shipment disappears. I would like to welcome Ben Strahan, the newest member of our ISP team. Ben will be handling both inside and outside sales and has many years of experience working in and with WISPs. Like everyone on our team, he has built and operated a WISP and worked as a consultant. He has great knowledge about licensed and unlicensed links and will be a valuable asset to our team. You may reach Ben at 979-431-0304, extension 9208 or email him at bstrahan@ispsupplies.com. Just when you thought a great product could not get any better, MikroTik has added 10G support for the first time, but in the most obvious place, their CloudCore Router line. The CCR1036-8G-2S+EM is their fastest router, now even faster with two SFP+ ports for 10G interface support (SFP+ module available separately). It uses the same 36 core Tilera CPU as the other CCR1036 model, and delivers the same performance, but now, ten gigabit links are possible. The device comes in a 1U rackmount case, has two SFP+ ports, eight Gigabit ethernet ports, a serial console cable and a USB port. The CCR1036-8G-2S+ has two SODIMM slots, by default it is shipped with 4GB of RAM, but has no memory limit in RouterOS (will accept and utilize 16GB or more). Also available now, the EM model with 16GB of RAM. Nice! All RouterOS versions are secure against the Heartbleed issue. All versions prior to v6.12 used an unaffected, older version of OpenSSL, and since v6.12 the latest OpenSSL version will be used, where the heartbleed issue is already fixed. We didn’t use any of the affected OpenSSL versions in any of our products, so no specific action is required on your side. If you had told me 5 years ago you had a link with more than 3 watts of power I would have assumed it was amped. Using power amplifiers with WiFi is an old idea, long since passed in today’s age of high power wireless cards and high sensitivity receivers. So, when I read the latest news from MikroTik, I was shocked to see they have a device that outputs more than 3 watts of power, 3.1 to be exact. The new MikroTik RBQRTG-2SHPnD is an integrated panel antenna and wireless card/motherboard all in one running RouterOS. If you need a small footprint, long range device, I think you found it. Speaking of innovative products, here is another one. A highly cost-effective way to connect two SFP/SFP+ devices (for example two units of CCR1036-8G-2S+) for very short distances, within racks and across adjacent racks, the MikroTik S+DA0001, an SFP to SFP device. 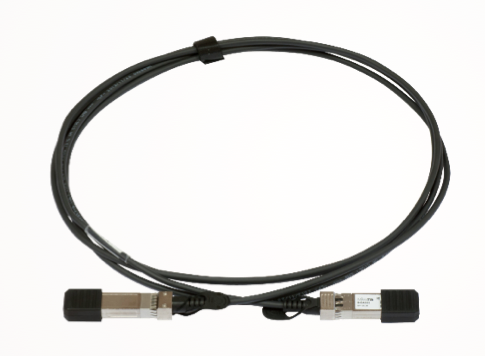 No patch cord needed, this is SFP modules and fiber all in one. Interesting!